Two commercial satellites for the expansion of communications services from space were launched atop an Ariane 5 rocket today, capping another successful year for the booster that saw a dozen payloads deployed in 2010. The heavy-lift launcher, making its 55th flight, climbed steeply through the late afternoon sky and headed downrange for a half-hour trek into geosynchronous transfer orbit to deliver the Spanish Hispasat 1E and South Korea's Koreasat 6 spacecraft. It was the Ariane rocket family's 199th mission, coming 31 years since the maiden launch in 1979. "I want to thank all of those who contributed to this new Ariane 5 success," said Arianespace Chairman & CEO Jean-Yves Le Gall. "And I would obviously very much like to thank the Arianespace operational team for their flexibility, reactivity, reliability and availability - and above all - the passion they bring enabled us to meet our promises." The Ariane achieved a highly elliptical orbit stretching 22,321 miles at its farthest point from Earth and 155 miles at the nearest. The satellites will use their onboard engines to circularize the orbit and reach geostationary slots in the coming days. Riding atop the dual payload stack was Hispasat, a powerful spacecraft to be operated by the Madrid-based company of the same name, will expanded available video and data transmission services for bridging the Atlantic and coverage across Europe. "In the middle of an important investment process, Hispasat 1E is the second of five new satellites laid out in our growth plan," said Petra Mateos, chairwoman of Hispasat. Manufactured by Space Systems/Loral with an 18-year lifetime, the 11,725-pound satellite carries 53 Ku-band transponders and a Ka-band capability. It will be parked in geostationary orbit over the equator at 30 degrees West longitude alongside the Hispasat 1C and 1D birds launched aboard Atlas 2AS rockets from Cape Canaveral in 2000 and 2002, respectively. "The Hispasat 1E satellite will offer new services for direct-to-home TV platforms, digital-terrestrial television and also for high-definition television as well as broadband services," said Antonia Abad, Hispasat's chief technology officer. Sharing the ride to orbit aboard the Ariane 5 rocket was the 6,275-pound Koreasat 6, a communications satellite designed to operate at least 15 years and serve South Korea by operator KT Corp. of Seoul. Built by Orbital Sciences with Thales Alenia Space supplying the communications payload, Koreasat 6 is bound for a geostationary orbital slot at 116 degrees East longitude. It has 30 Ku-band transponders for telecommunications and direct-to-home TV transmissions. "Koreasat 6 will upgrade broadcasting service quality by providing enhanced HD and 3D satellite TV programs and maintaining the continuity of Koreasat 3 services," said Ho-Ick Suk, vice chairman of KT Corp. The new satellite replaces Koreasat 3 that launched aboard an Ariane 4 rocket in 1999 and was sold to another Asian spacecraft controller earlier this year. 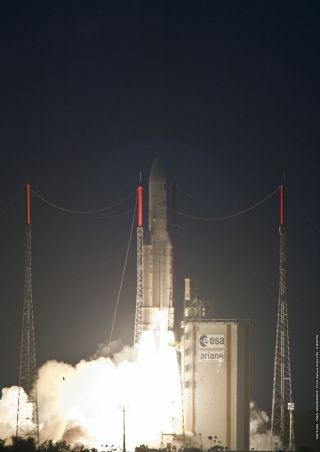 Today's successful flight represented the Ariane 5's sixth launch of 2010, all occurring in a hectic seven-month stretch, with each of the rockets deploying pairs of communications satellites. The dozen satellites amounted to 99,725 pounds. Next up is the high-profile launch of the European Space Agency's Automated Transfer Vehicle cargo resupply ship to rendezvous with the International Space Station. That rocket is being processed at the Kourou spaceport for a planned Feb. 15 liftoff on the milestone Flight 200. Copyright 2010 SpaceflightNow.com, all rights reserved.